Photo by Dennis Yang made available through a Creative Commons license. In every Austin home, there is the option to trash your waste or recycle it (many even have a composting option available). So why aren’t Austinites given the same opportunity at the city of Austin’s parks and recreational facilities? At the April 11 meeting of the Zero Waste Advisory Commission, Liana Kallivoka, the assistant director of the Parks and Recreation Department, provided an answer to this question. “There is an undeniable financial block for the implementation,” she explained. 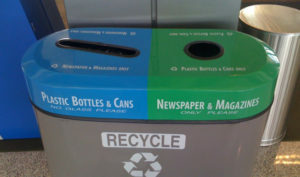 “At the rate we’re going, we’re going to be in the 2020s without a full implementation of recycling,” said Commissioner Kaiba White, who proposed a resolution to recommend that in 2019 City Council fund the initiative to expand the recycling program in city of Austin parks and recreational facilities. The resolution was passed unanimously. The city’s Universal Recycling Ordinance states that “all commercial (including City) properties in Austin are required to have recycling.” However, open spaces, including public parks, are not included in the current ordinance. That is not to say that the city doesn’t recycle. Currently, recycling is available at administrative offices, recreation centers, some pools, museums and cultural centers, and special events at parks. However, Parks and Recreation wants a comprehensive program in all its outdoor facilities, and to do so it has partnered with Austin Resource Recovery. Another suggestion to offset costs came from Commissioner Amanda Masino, who proposed repurposing the proceeds that Parks and Recreation receives from festivals and events that are held on city spaces to fund the expansion of recycling efforts. The department receives several dollars from each ticket sold at public festivals. Andrew Dobbs from the Texas Campaign for the Environment noted that another source of funding could come directly from Council members. Council Member Alison Alter provided funding for recycling in her District 10 parks. Kallivoka explained that the department needs $250,000 to roll out a three-phase recycling implementation in city parkland. Each pair of trash-recycling bins costs $1,100 to purchase and install, and there are 2,500 trash-only receptacles to replace in city parks. “I believe we are a creative, innovative community, and we don’t have to reinvent the wheel on this,” said Chair Gerry Acuna. He proposed involving private businesses in the initiative. “Let them have some ownership in this. It could provide a lot of funding,” he said. Regardless of how Council chooses to do it, commissioners agreed that Parks and Recreation is going to require a significant addition of funding for this initiative.